SPOILER ALERT: Mainstream media don’t want you to see our film or fight for Freedom of Information. We are doing BOTH nationwide in 2014 & 2015! We launched a tour across the US, last Feb 25th with grassroots screenings coast-to-coast, followed by awesome post-screening events (Q&As, discussions, gigs and comedy) all geared up to evoke awareness and action to take our media BACK! We have just completed the first 20 screenings of the tour. Click here to see the dates and venues of the ongoing screenings throughout the USA including Chicago, Boston, Burlington, Baltimore, Philadelphia, Tampa Bay, New Jersey and New York. We made Shadows Of Liberty because we believe that media is the most powerful entity on earth. The subject remains crucial not only for the state of the media itself but also for all issues facing the U.S. and the world today. Ultimately, the media is the place where we learn about the world. Currently, only a handful of private corporations control the vast majority of the media landscape putting their profits and access to power before all else. Access to news and information is integral for the betterment of our lives and society. The existing control and monopoly over the media landscape is a detriment to society and it needs to stop. We made this film to foster awareness, inspire change, support independent media, and help promote a media system that is trustworthy and accessible to everyone. We’re grateful for the support we have already received from other independent media outlets, media reform organizations, and individuals that have helped us get the film seen but it’s not enough! We need your help to get our film seen, to bring it to your community, and to continue sparking conversation and action for media reform. Your support will help our film travel to community and theatrical screenings across the United States. We will work with media reform organizations, independent media outlets, universities and colleges, religious institutions, unions and others dedicated to journalism and the fight for freedom of information. 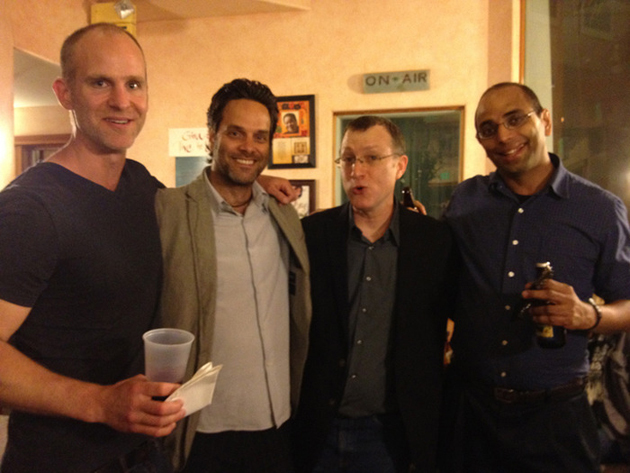 Our goal is to bring the film to 171 well-researched cities. Many of the film screenings will in turn be fundraising events for other independent media outlets and organizations in the communities where we screen. We are already picking-up steam as screenings with exciting post-film programming are being booked and we want to continue this momentum throughout 2014. What is Shadows of Liberty About? 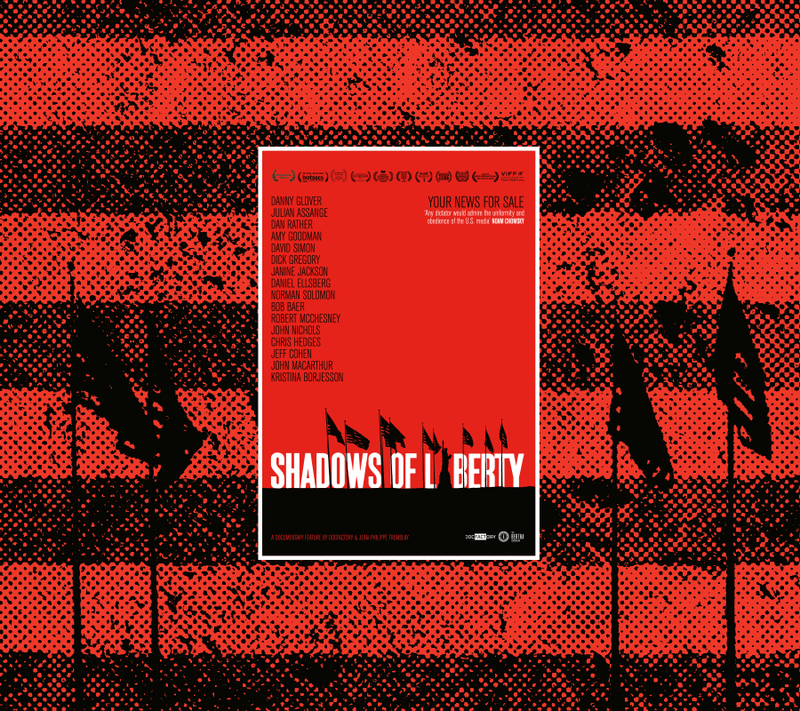 Shadows Of Liberty presents insider accounts of how journalists and their news stories have been censored, manipulated, and destroyed by corporate greed and power. 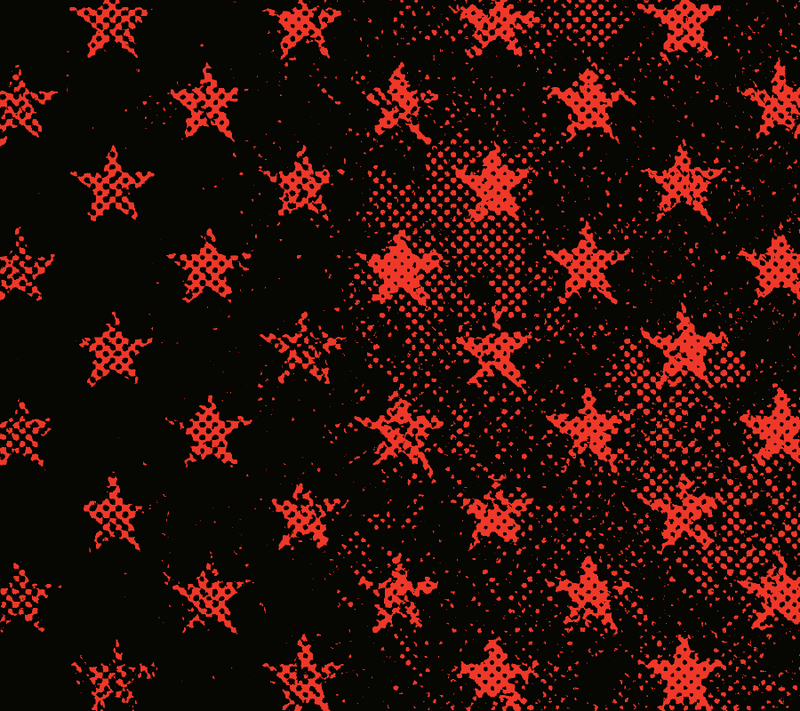 Julian Assange, Danny Glover, David Simon, Amy Goodman, Dan Rather, and a host of award winning journalists and government experts all discuss their experiences at the dark heart of American news. The overwhelming power of these private corporations has come through a series of important political handouts by government throughout US history, especially in the last 30 years. Stories of corporate greed winning out over fundamental media values are laid wide open in our critically acclaimed film. 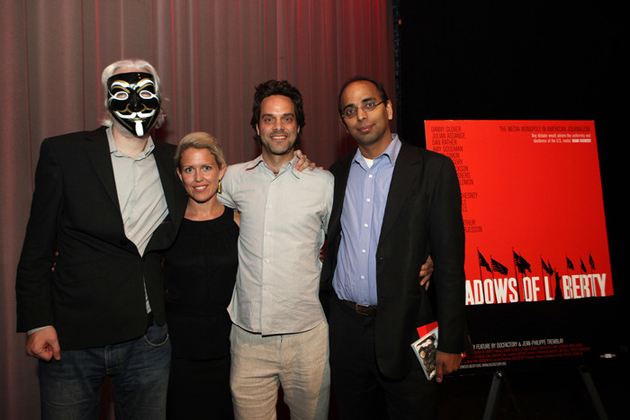 The prestigious Cinema For Peace Foundation in Berlin, Germany, nominated Shadows of Liberty as the Most Valuable Documentary Film of the Year 2013, and the NewFilmmakers – Los Angeles organization has nominated the film for Best Documentary Feature and Best New Filmmaker 2013, the winner will be announced February 22, 2014. 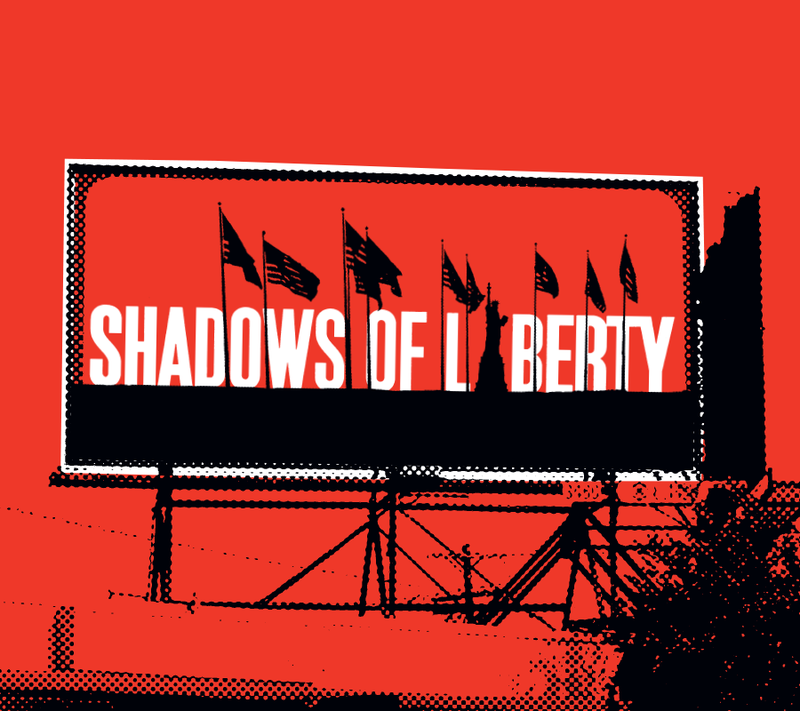 Shadows of Liberty was selected to 25 film festivals worldwide including the acclaimed HotDocs festival in Toronto, Canada, the Sheffield DOC/FEST in England, and IDFA (International Documentary Film Festival Amsterdam) in the Netherlands. Special screenings also include presentations at London England’s Front Line Club, as well as opening the National Conference for Media Reform in Denver, Colorado, in 2013. If you are familiar with the film festival circuit, you might notice something odd about the festival icons below… None of them are for US Film Festivals. 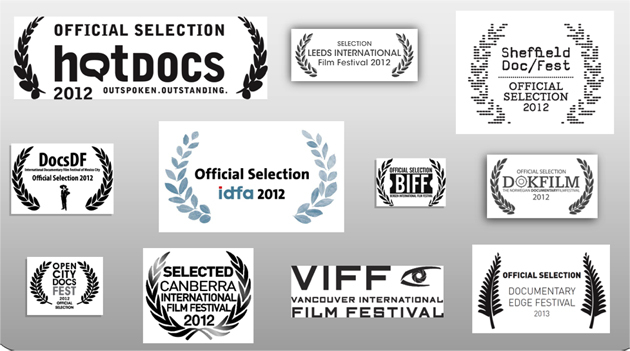 Although Shadows of Liberty has been acclaimed all over the world, the film was not accepted by any major or medium-size US Film Festivals. In the US there were only a couple of small-size film festivals interested in our film and we are very thankful for them. The independent satellite network KCET/LINK TV supports and broadcasts the film periodically in the US, but the film remains virtually unknown throughout the United States. And it is broadcast through the Al Jazeera network in 26 countries throughout the Middle East & North Africa. But we need to get this out to the people in the United States! Rather than crying about our USA distribution woes, we decided we would take it upon ourselves to make sure people throughout the United States have the opportunity to see Shadows of Liberty, and we’re doing it grassroots style! We’ve researched the landscape for each state in the US and identified 171 cities we think are ideal for Shadows of Liberty screenings, here they are. We are reaching out to the media reform organizations, local media outlets, journalists, higher education institutions, religious groups, unions, social change organizations, and other groups that have a vested interest in making sure people see our film. By working with these groups to organize screenings in our target cities, we will create opportunities for people to see Shadows of Liberty and speak out about one of the most important issues of our times! Bringing People Together: This screening tour is about creating opportunities for people to come together to see the film. It’s about bringing communities and cities together so that we can have more control over the news and information. Inspiring Action: It serves no one (except the people who benefit from the existing media system) if folks just watch the film. 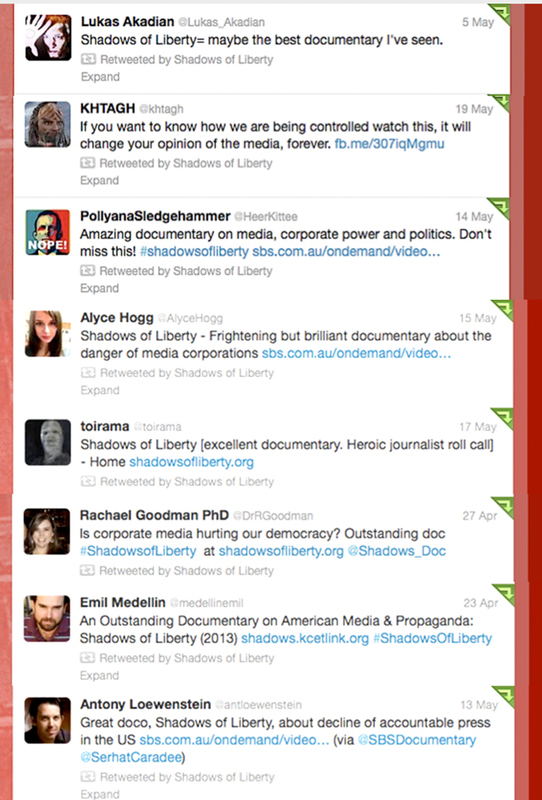 One of the primary objectives of the Shadows Of Liberty screening tour is to work with partner organizations to organize post screening program that answers the question: “So what can we do about it?” Everyone who attends a tour event should leave feeling empowered and well informed of specific actions they can take to change the media system in the US. Reaching Outside the Choir: Like so many folks and organizations fighting the good fight, we understand it’s not enough to always get the same people together! Taking on corporate media is a daunting task, and it requires the support and participation of everyone – including the folks who generally sit on the sidelines when it comes to participation in civic life! We have several ideas to help reach outside the choir such as having comedians to MC screenings, creating art during screenings, partnering with Geeks who Drink to do trivia after the film, doing screenings at bars and street cinema. We think these events will draw in folks not currently engaged in media reform efforts, and we can’t wait to test our theory! Creating A High Tide That Raises All Boats: Another objective of the Shadows Of Liberty Tour is to develop various event models and put on screenings that are financially beneficial for our partner organizations. 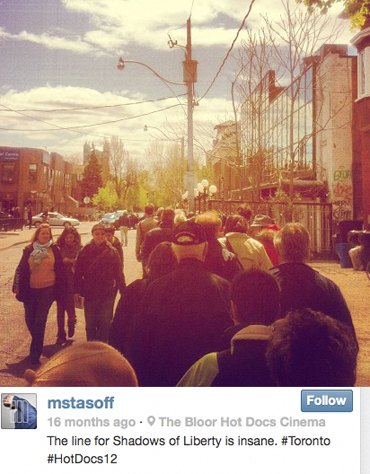 Nonprofit organizations often compete for funds, and operate under a scarcity mentality. We want to use screenings throughout the tour as opportunities to help coach organizations on fundraising, and raise funds for the critical work organizations are doing to make the world a better place. Help identify or host a screening: If you know organizations that might be interested in partnering in a screening anywhere in the US, please let us know. Or, better yet, if you would like to host a screening of your own, we will work with you every step of the way to make it happen! Check here to see a whole set of resources we have developed to help you make your screening successful. Let us crash on your couch: Part of what will make our tour financially viable is people’s willingness to host us as we travel to every screening. We would love for you to drop us a line if you can put us up for a night when we are in your neck of the woods. 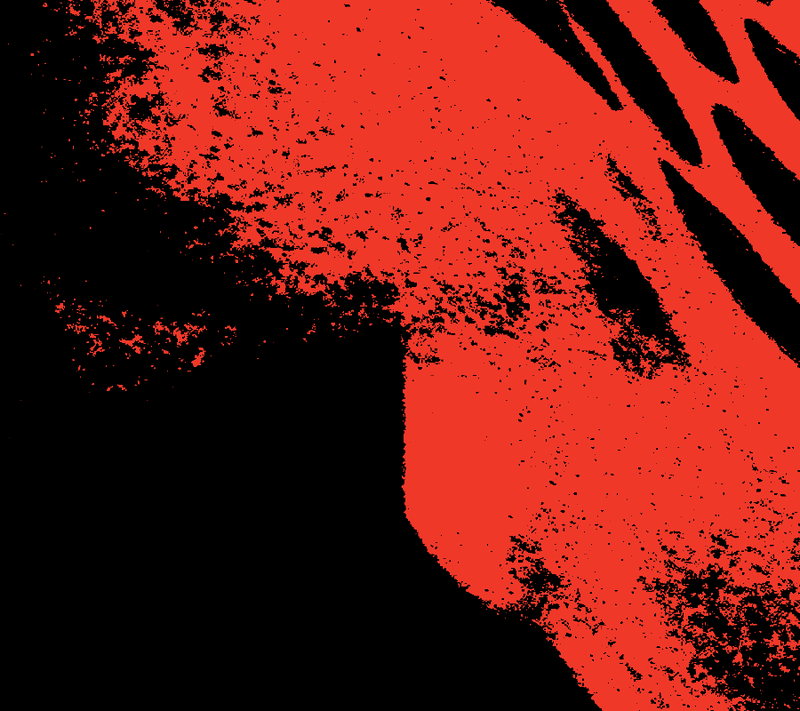 We will also be publishing the dates and locations of the tour’s second leg very soon so stay tuned! Spread the word: Please share our donation link and information about our tour with your friends, family, and anyone else you think might be interested by our film and what we are doing. Help us spread the word by posting on social networking platforms such as Facebook, Twitter, Instagram, Pinterest, YouTube, Tumbler or your favorite social media tool. And of course don’t forget to follow us on Twitter and YouTube, and ‘like’ us on Facebook!